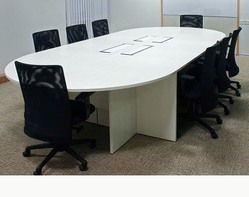 WOODEN CONFERENCE TABLE Top 25mm thick, Legs made by 75mm thick, modesty panel made by 18mm thick hard wood ply surfaces overed with 4mm thick OST. visible edges and bottom of the table legs covered by 3" x 2" and 3" x 12mm teak wood. Fully melamine finished. 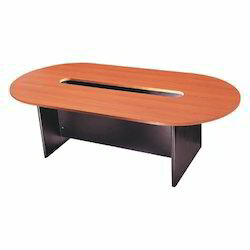 made with 25mm pre laminated board with top edges covered with 2mm PVC Edge band. 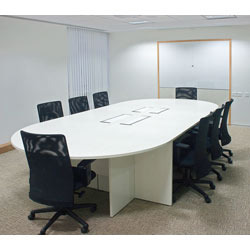 We are also engaged in manufacturing and supplying a wide range of Meeting & Conference Tables. 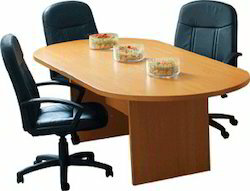 These tables are manufactured as per the latest trends of the market using superior quality raw material and advanced machines. 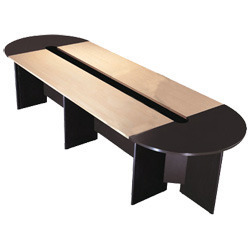 We offer these tables in various designs, sizes and styles to meet the diverse requirements of our clients. Top made with 25mm thick Novopan board edges covered with 2mm edge banded. Leg and other parts made with 18mm edges covered with .5mm edge banded.